With a bright greenish yellow appearance, our Solvent Yellow 16 is suitable for application in various industries. We are one of the leading Manufacturers, Exporters and Suppliers of Solvent Yellow 16 in Maharashtra, India. Our company makes it at our advanced plant with reliable chemical agitators. 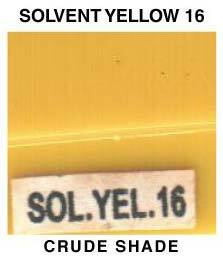 We are offering Solvent Yellow 16 in customized packaging.